Biomes are groups of ecosystem that have the same climate and dominant communities. They are complex terrestrial (mostly earth's surface) systems of abiotic and biotic factors that cover a large area and are characterized by certain soil & climate characteristics and by certain groupings of plants and animals. Living organisms prefer certain climatic conditions. This means that animal and plants are usually found only in regions that suit them. A polar bear, for example, will be found in a region of low temperature and low humidity. Such a region of the biosphere is called the arctic. Climate determines the type of biome in a given area, although individual ecosystems may vary due to many local abiotic and biotic factors. Ecosystem stability, succession and biodiversity are intrinsically linked. What are the strengths and weaknesses of models of succession and zonation? How could the R/R ration be used to estimate whether the harvesting of a natural capital, such as trees , is sustainable or not? 2.4.U1 Biomes are collections of ecosystems sharing similar climatic conditions that can be grouped into five major classes: aquatic, forest, grassland, desert and tundra. Each of these classes has characteristic limiting factors, productivity and biodiversity. Terrestrial Biomes: tundra, grassland, desert, taiga, temperate forest, tropical forest. A biome has distinctive abiotic factors and species which distinguish it from other biomes. Water, insolation and temperature are the climate controls important when understanding how biomes are structured, how they function and where they are found round the world. Biomes usually cross national boundaries (biomes do not stop at a border; for example, the Sahara, tundra, tropical rainforests). example, temperate grassland or a local example. Limit climate to temperature, precipitation and insolation. It is required that you need to be able to explain the distribution, structure and relative productivity of tropical rainforests, deserts, tundra and one other biome. Climate should only be explained in terms of temperature, precipitation and insolation only. You should study at least four contrasting pairs of biomes. Examples of contrasting biomes include; temperate forests and tropical seasonal forests; tundra and deserts; tropical coral reefs and hydrothermal vents; temperate bogs and tropical mangrove forests. 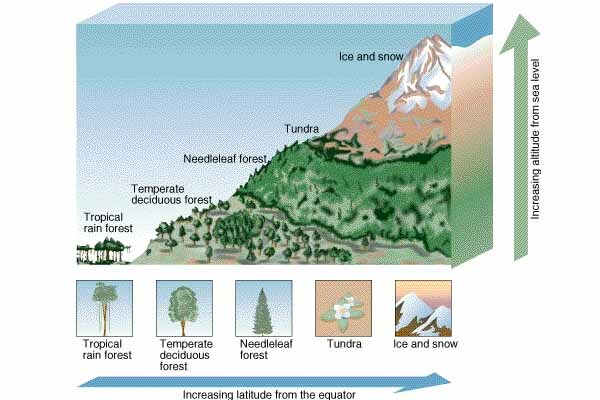 2.4.U2 Insolation, precipitation and temperature are the main factors governing the distribution of biomes. 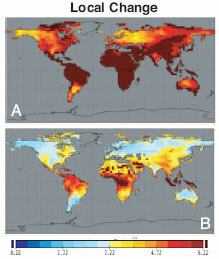 ​The distribution of biomes results from insolation, precipitation and temperature. Climate, terrain (or geography) and ocean and wind currents also play important roles. ​Insolation is measured by the amount of solar energy received per square centimeter per minute. As the sun rotates around the sun, the position of the land masses will change resulting in various concentrations of solar radiation over the land masses. The atmosphere and its circulation systems determines where moisture-carrying air masses do and do not go. The energy source of those circulatory systems are the sun. The sun's energy drives atmospheric movements, sustains photosynthesis, and propels the seasons. the topography of the continents. Plant biomes are based primarily on the distribution of the dominant vegetation. Animal biomes are usually named after regions because their distribution is more difficult to define. 2.4.U3 The tricellular model of atmospheric circulation explains the distribution of precipitation and temperature and how they influence structure and relative productivity of different terrestrial biomes. ​The tricellular model explains the distribution of precipitation and temperature and how they influence structure and relative productivity of different terrestrial biomes. The tricellular model is made up of three different air masses, these control atmospheric movements and the redistribution of heat energy. The three air masses, starting from the equator, are called the Hadley cell, Ferrel cell and the polar cell. The tricellular model also contains the ITCZ (Inter-tropical convergence zone), this is the meeting place of the trade winds from both the northern hemisphere and the southern hemisphere. The ITCZ is a low pressure area where the trade winds, which have picked up latent heat as they crossed oceans, are now forced to rise by convection currents. These rising convection currents are then cooled adiabatically to form massive cumulonimbus clouds. As you go up in altitude air cools, becomes more dense and falls back towards earth’s surface. These convection currents drive the Earth’s wind patterns and affect the biomes. 2.4.U4 Climate change is altering the distribution of biomes and causing biome shifts. A changing global climate threatens species and ecosystems. The distribution of species is largely determined by climate, as is the distribution of ecosystems and plant vegetation zones (biomes). Climate change may simply shift these distributions, but often, barriers and human presence will provide no opportunity for distributional shifts. For these reasons, some species and ecosystems are likely to be eliminated by climate change. ​Zonation refers to changes in community along an environmental gradient due to factors such as changes in altitude, latitude, tidal level or distance from shore (coverage by water). The distinct vertical layers experience particular abiotic conditions. This is particularly clear in the distribution of plants and animals on a rocky seashore, where different species inhabit a series of horizontal strips or belts of the shore, approximately parallel to the water's edge. In many places the strips (zones) are sharply bounded by the differently coloured seaweeds that populate them. The division of vegetation in relation to a successional sequence (e.g. in sand-dunes), implying that spatial zonation may correspond to temporal processes. ​Kite diagrams are a chart that shows the number of animals (or percentage cover for plants) against distance along a transect. The distribution of organisms in a habitat is affected by the presence of other living organisms, such as herbivores or predators that might eat them. It is also affected by abiotic factors (physical factors) such as availability of light or water. The width of the “kite” represents the number of species. 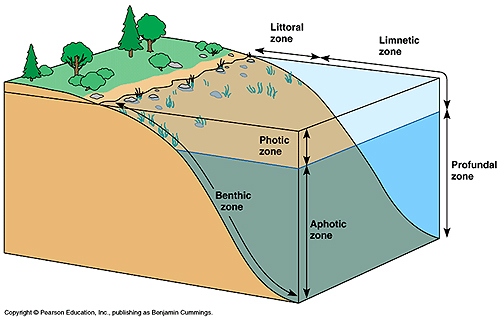 The kite diagram is frequently used to show zonation along a transect. A gradual change in the distribution of species across a habitat is called zonation. It can happen because of a gradual change in an abiotic factor. A transect is line across a habitat or part of a habitat. It can be as simple as a string or rope placed in a line on the ground. The number of organisms of each species can be observed and recorded at regular intervals along the transect. ​​Succession is a directional non-seasonal cumulative change in the types of plant species that occupy a given area through time. It involves the processes of colonization, establishment, and extinction which act on the participating plant species. Most successions contain a number of stages that can be recognized by the collection of species that dominate at that point in the succession. Succession begin when an area is made partially or completely devoid of vegetation because of a disturbance. Some common mechanisms of disturbance are fires, wind storms, volcanic eruptions, logging, climate change, severe flooding, disease, and pest infestation. Succession stops when species composition changes no longer occur with time, and this community is said to be a climax community. Succession- change in the community structure of a particular area over time. Primary succession-colonization of newly created land by organisms (rock). Secondary succession-occurs in places where a previous community has been destroyed. (forest/fire) It is faster than primary succession because of the presence of soil and a seed bank. Pioneer-earliest community of the succession. Climax community-the last and final community. Zonation- The arrangement or patterning of plant communities or ecosystems into bands in response to change, over a distance, in some environmental factor. The species living in a particular place gradually change over time as does the physical and chemical environment within that area. Succession takes place because through the processes of living, growing and reproducing, organisms interact with and affect the environment within an area, gradually changing it. Each species is adapted to thrive and compete best against other species under a very specific set of environmental conditions. If these conditions change, then the existing species will be outcompeted by a different set of species which are better adapted to the new conditions. The most often quoted examples of succession deal with plant succession. It is worth remembering that as plant communities change, so will the associated micro-organism, fungus and animal species. Succession involves the whole community, not just the plants. Change in the plant species present in an area is one of the driving forces behind changes in animal species. This is because each plant species will have associated animal species which feed on it. The presence of these herbivore species will then dictate which particular carnivores are present. The structure or 'architecture' of the plant communities will also influence the animal species which can live in the microhabitats provided by the plants. Changes in plant species also alter the fungal species present because many fungi are associated with particular plants. Succession is directional. Different stages in a particular habitat succession can usually be accurately predicted. These stages, characterised by the presence of different communities, are known as 'seres'. Communities change gradually from one sere to another. The seres are not totally distinct from each other and one will tend to merge gradually into another, finally ending up with a 'climax' community. Succession will not go any further than the climax community. This is the final stage. This does not however, imply that there will be no further change. When large organisms in the climax community, such as trees, die and fall down, then new openings are created in which secondary succession will occur. Many thousands of different species might be involved in the community changes taking place over the course of a succession. For example, in the succession from freshwater to climax woodland. The actual species involved in a succession in a particular area are controlled by such factors as the geology and history of the area, the climate, microclimate, weather, soil type and other environmental factors. In early stages, gross productivity is low due to the initial conditions and low density of producers. The proportion of energy lost through community respiration is relatively low too, so net productivity is high, that is, the system is growing and biomass is accumulating. In later stages, with an increased consumer community, gross productivity may be high in a climax community. However, this is balanced by respiration, so net productivity approaches zero and the production:respiration (P:R) ratio approaches one. A disturbance is any event, either natural or human-induced that changes the existing condition of an ecosystem. Disturbances in forest ecosystems affect resource levels, such as soil organic matter, water and nutrient availability, and interception of solar radiation. 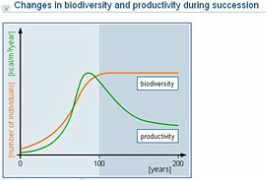 Changes in resource levels, in turn, affect plants and animals over time, leading to succession. All of these have an effect of making gaps available that can be colonised by pioneer species within the surrounding community. This adds to both the productivity and diversity of the community. Biological diversity, often shortened to biodiversity, is the variation of life at all levels of biological organization, referring not only to the sum total of life forms across an area, but also to the range of differences between those forms. 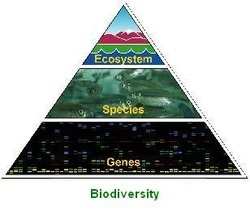 Biodiversity runs the gamut from the genetic diversity in a single population to the variety of ecosystems across the globe. 2.4.U9 r- and K-strategist species have reproductive strategies that are better adapted to pioneer and climax communities, respectively. 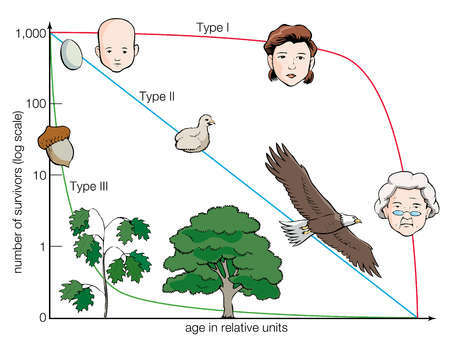 The terms r-selection and K-selection have also been used by ecologists to describe the growth and reproductive strategies of various organisms. Those organisms described as r-strategists typically live in unstable, unpredictable environments. Here the ability to reproduce rapidly (exponentially) is important. K-strategists, on the other hand occupy more stable environments. They are larger in size and have longer life expectancies. They are stronger or are better protected and generally are more energy efficient. In general, communities in early succession will be dominated by fast-growing, well-dispersed species (opportunist, fugitive, or r-selected life-histories). During succession Gross Primary Productivity tends to increase through the pioneer and early wooded stages and then decreases as climax community reaches maturity. This increase in productivity is linked to growth and biomass. Early seral stages are usually marked by rapid growth and biomass biomass accumulation - grasses, herbs and small shrubs. 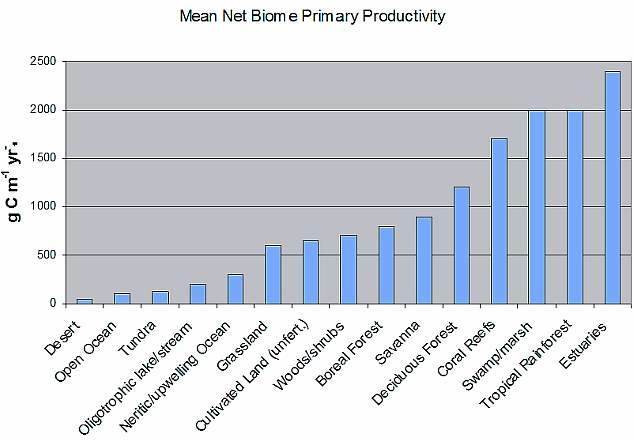 Gross Primary Productivity is low but Net Primary Productivity tends to be be a large proportion of GPP as with little biomass in the early seral stages respiration is low. As the community develops towards woodland and biomass increases so does productivity. But NPP as a percentage of GPP can fall as respiration rates increase with more biomass. Succession is the process of ecosystem recovery after some disturbance. Biomass is at maximum in the undisturbed ecosystem; it increases up to this maximum during succession. Plant productivity also grows, especially if the plant cover was destroyed substantially by the disturbance. Productivity of the ecosystem as a whole (i.e. the difference between net primary productivity and its consumption by ecosystem's heterotrophs) in the process of succession tends to zero. Biodiversity measured as the total number of species in the ecosystem does not change. However, biodiversity measured as the number of species having a substantial population density is lower in the undisturbed ecosystem than in the disturbed one. 2.4.U12 In a complex ecosystem, the variety of nutrient and energy pathways contributes to its stability. Redundancy in ecosystem structure and function often infers stability on a system. For instance, if there is more than one (redundant) population of microbes that convert ammonium to nitrate and a disturbance wipes out one population, that function (nitrification) will continue to be performed by the remaining populations. Resistance - the ability of the ecosystem to continue to function without change when stressed by disturbance. 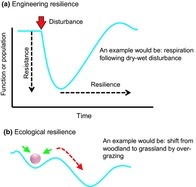 Resilience - the ability of the ecosystem to recover after disturbance. Climatic and edaphic (soil) factors determine the nature of a climax community. Variations in climatic conditions and soil structure greatly effect which plant species can thrive. Human factors frequently affect this process through fire, agriculture, grazing and/or habitat destruction. The more complex the ecosystem, the more stable they are due to the variety of nutrient and energy pathways. If one collapses its overall effect is low as there are many others to takes its place. 2.4.U14 Human activity is one factor that can divert the progression of succession to an alternative stable state by modifying the ecosystem; for example, the use of fire in an ecosystem, the use of agriculture, grazing pressure, or resource use (such as deforestation). This diversion may be more or less permanent depending upon the resilience of the ecosystem. Human activity is one factor which can divert the progression of succession to an alternative stable state, by modifying the ecosystem, for agriculture, grazing pressure, or resource use such as deforestation. This diversion may be more or less permanent depending upon the resilience of the ecosystem. 2.4.U15 An ecosystem's capacity to survive change may depend on its diversity and resilience. 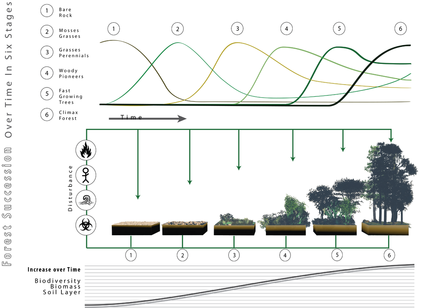 an ecosystem can tolerate disturbance without collapsing into a different state that is controlled by a different set of processes. Resilience is not about a single ideal ecological state, but an ever changing system of disturbance and recovery. 2.4.A1 Explain the distributions, structure, biodiversity and relative productivity of contrasting biomes. Many places on Earth share similar climatic conditions despite being found in geographically different areas. As a result of natural selection, comparable ecosystems have developed in these separated areas. Scientists call these major ecosystem types biomes. The geographical distribution (and productivity) of the various biomes is controlled primarily by the climatic variables precipitation and temperature.. Most of the classified biomes are identified by the dominant plants found in their communities. For example, grasslands are dominated by a variety of annual and perennial species of grass, while deserts are occupied by plant species that require very little water for survival or by plants that have specific adaptations to conserve or acquire water. The diversity of animal life and subdominant plant forms characteristic of each biome is generally controlled by abiotic environmental conditions and the productivity of the dominant vegetation. In general, species diversity becomes higher with increases in net primary productivity, moisture availability, and temperature. Adaptation and niche specialization are nicely demonstrated in the biome concept. Organisms that fill similar niches in geographically separated but similar ecosystems usually are different species that have undergone similar adaptation independently, in response to similar environmental pressures. The vegetation of California, Chile, South Africa, South Australia, Southern Italy and Greece display similar morphological and physiological characteristics because of convergent evolution. In these areas, the vegetation consists of drought-resistant, hard-leaved, low growing woody shrubs and trees like eucalyptus, olive, juniper, and mimosa. 2.4.A2 Discuss the impact of climate change on biomes. 2.4.A3 Describe the process of succession in a given example.. The characteristic plants which define each of the biomes constitute part of what is known as the climax community. The types of plants that characterize each biome have evolved to the unique climatic conditions in that part of the world. If such a community is destroyed (by fire, logging, plowing, etc.) - and then left alone - the biome will regenerate itself over a period of time. It will go through a number of intermediate stages until it reached the climax stage again. This process is called succession. In a Early seral stages are highly productive but require large inputs of nutrients and also tend to lose nutrients. Biomass increases, but there is low productivity and fluctuations in biomass are common. These seral stages are dominated by "weedy" or "r-adapted" species which reproduce quickly, but often die young. Most of their energy goes into reproduction. There are relatively few species in early seral stages. Climax seral stages are much more complex, with many species. They create a favorable environment for many species. 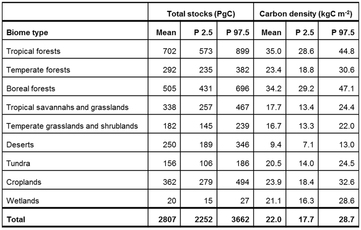 Biomass does not fluctuate, and decomposition rates are roughly equivalent to new production. Nutrients are cycled efficiently, and rarely leave the ecosystem. Individual organisms are longer-lived, since they invest more resources in themselves and less in producing offspring. Locally, a recently cleared field is an example of an early seral stage. It is colonized by grasses and other plants that produce many seeds, such as many annuals. These plants may live only one year, set seed, then die. The organisms in the field will not be able to cycle all of the nutrients, and many nutrients will run off with rainfall. On the other hand, the climax forest is characterized by trees, which are long-lived. There are many species, and each provides living space and food resources for other plants and a host of animals. Decomposing materials are recycled; few escape though the waters of the forest streams. If one farms in a rain forest, the community is moved from a climax community to an artificial community which resembles an early seral stage. The farm field will lose a lot of nutrients, something that tropical soils do not have in abundance. The land will be useless for farming in a few years. The size of the organisms increases with trees, creating a more hospitable environment. Energy flow becomes more complex as simple food chains become complex food webs. Soil depth, humus, water-holding capacity, mineral content, and cycling all increase. Biodiversity increases because more niches (lifestyle opportunities) appear and then falls as the climax community is reached. NPP and GPP rise and then fall. 2.4.A5 Discuss the factors that could lead to alternative stable states in an ecosystem. You need to be able to discuss the factors which could lead to alternative stable states in an ecosystem, and discuss the link between ecosystem stability, succession, diversity, and human activity. A 2.4.6 Distinguish the roles of r and K selected species in succession. ​Industrial air pollution from the developed world is carried on the dominant wind currents up to the arctic. After settling onto the tundra, snow and ice it is absorbed into the food chain. The people and creatures there have some of the highest concentrations of toxins in their bodies of anywhere on earth. ​Biodiversity is the variety of life found at all levels of biological organization, ranging from individuals and populations to species, communities and ecosystems. A population is a group of individuals of the same species in a given location - a group that is genetically different from other such groups. Species are made up of one or more populations. There were an estimated 2.2 billion populations on Earth. populations are going extinct at a rate of 32,000 per day. The loss of populations is occurring three to eight times faster than species loss. If all of a species' populations but one are destroyed the species technically still exists. However, all of the beneficial interrelations flowing from those populations and their biodiversity will have been lost. 2.4.S2 Interpret models or graphs related to succession and zonation. ​​​Correct use of terminology is a key skill in ESS. It is essential to use key terms correctly when communicating your understanding, particularly in assessments. Use the quizlet flashcards or other tools such as learn, scatter, space race, speller and test to help you master the vocabulary. This activity, prepared by TES, will help you better understand the relationship between temperatures, precipitation and specific biomes. 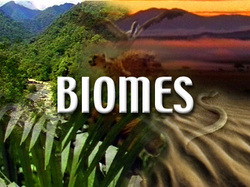 Climate plays an important role in the development of biomes. Robert Whittaker, an American ecologist, plotted rainfall vs. temperature for points all over the globe on a single graph (see below). He then looked at what biomes had developed at those sites, and was able to group the different biomes according to mean annual temperature and precipitation, as the shaded areas in the graph below indicate. Note that in Whittaker's diagram the temperature axis is reversed; that is temperature goes DOWN as you move to the right. Theoretically, if you know the average temperature and precipitation for a site, you should be able to predict what biome will develop there. Ecosystems are studied by measuring biotic and abiotic factors—how can you know in advance which of these factors are significant to the study? Ride the rapids with Bill Nye in the "Rivers and Streams" episode. Most rivers start high in mountains or hills. Rain, snow, fog and melting glaciers make little trickles or "rills" of water. Bill's heating up and chilling out in the "Deserts" episode. About 20% of the Earth is a desert. Deserts are places that get very little precipitation (rain or snow) each year, and that makes them extremely dry. Satellite-based passive microwave images of the sea ice have provided a reliable tool for continuously monitoring changes in the Arctic ice since 1979. Every summer the Arctic ice cap melts down to what scientists call its "minimum" before colder weather begins to cause ice cover to increase. The ice parameters derived from satellite ice concentration data that are most relevant to climate change studies are sea ice extent and sea ice area. This graph displays the area of the minimum sea ice coverage each year from 1979 through 2013. In 2013, the Arctic minimum sea ice covered an area of 4.704 million square kilometers. Paul Andersen explains the differences between an r and a K selected species. He starts with a brief description of population growth noting the importance of; r or growth rate, N or number of individuals in the population, and K the carrying capacity. He describes three different survivorship curves found in organisms. He lists the characteristics of r-selected species like bacteria and K-selected species like humans. In the world of ecology, the only constant is change - but change can be good. Today Hank explains ecological succession and how ecological communities change over time to become beautiful, biodiverse mosaics. 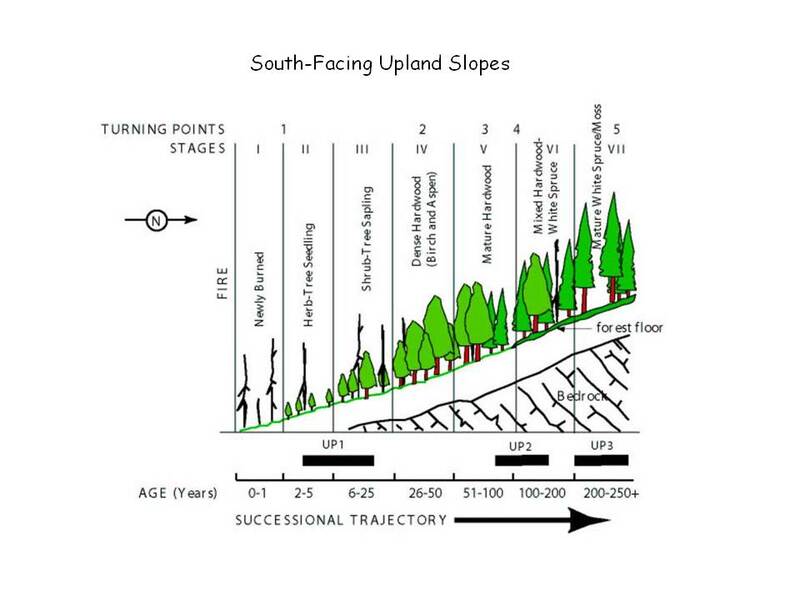 ​Paul Andersen describes the process of ecological succession. During this process life reestablished itself after a disturbance. During primary success all of the material is removed including the soil. For example during a volcanic eruption all traces of life are removed. However during secondary success the soil remains intact. An example of secondary success is wildfires. ​Succession, disturbances and the difference between man-made and natural disturbances and how land owners can use disturbance practices to mimic nature.